M. Antoninus Gordianus, grandson of the elder Gordianus, either by a daughter or by the younger Gordianus. The soldiers proclaimed him Emperor in July, A.D. 238, after the murder of Balbinus and Pupienus. He defeated the Persians in 242. He was assassinated in 244 and succeeded by Philippus. Obverse: IMP CAES M ANT GORDIANVS AVG, Radiate draped and cuirassed bust right. Reverse: FIDES MILITVM, Fides standing facing, head left, holding standard and scepter. 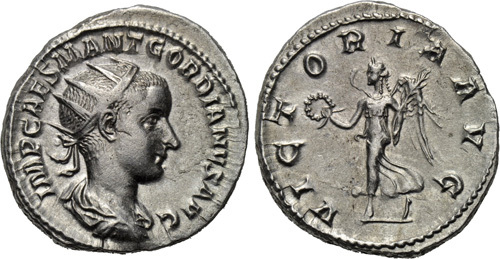 Reverse: IOVI CONSERVATORI, Jupiter standing, head left, holding thunderbolt and scepter; to left, Gordian standing left. Reverse: PAX AVGVSTI, Pax standing left, holding olive branch and scepter. Reverse: PROVIDENTIA AVG, Providentia standing left, holding globe and scepter. Reverse: VICTORIA AVG, Victory advancing left, holding wreath and palm. Reverse: VIRTVS AVG, Virtus, helmeted and in military dress, standing left, resting right hand on shield set on ground and holding vertical reversed spear in left. Reverse: VOTIS DECENNALIBVS in laurel-wreath. Reverse: P M TR P II COS P P, Fides standing facing, head left, holding standard and scepter. 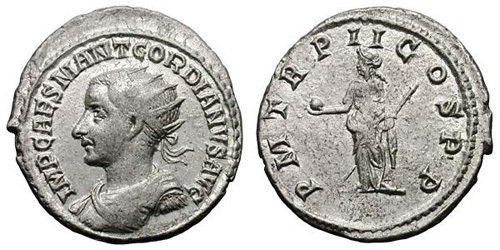 Reverse: P M TR P II COS P P, Jupiter standing, head left, holding thunderbolt and scepter; to left, Gordian standing left. Reverse: P M TR P II COS P P, Pax standing left, holding olive branch and scepter. Reverse: P M TR P II COS P P, Providentia standing left, holding globe and transverse scepter. Reverse: P M TR P II COS P P, Victory advancing left, holding wreath and palm. Reverse: P M TR P II COS P P, Virtus, helmeted and in military dress, standing left, resting right hand on shield set on ground and holding vertical reversed spear in left. Reverse: P M TRI P CON P P, Serapis standing left, modius on head, raising right hand and holding transverse scepter in left. 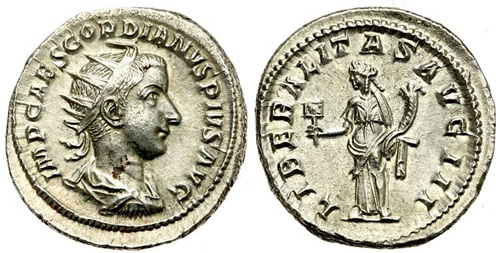 Reverse: AEQVITAS AVG, Aequitas standing facing, head left, holding scales and cornucopiae. 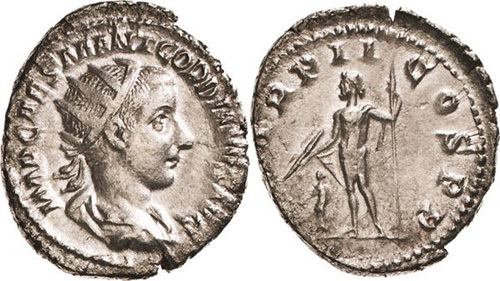 Reverse: CONCORDIA AVG, Concordia seated left, holding patera and double cornucopia. Reverse: LIBERALITAS AVG II, Liberalitas standing, head left, holding abacus and cornucopia. 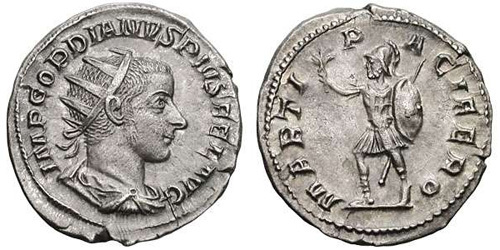 Reverse: P M TR P II COS P P, Emperor standing left, sacrificing out of patera over lit tripod and holding short scepter. Reverse: ROMAE AETERNAE, Roma seated left on shield, holding Victory and spear. Reverse: VIRTVS AVG, Virtus standing left, holding olive branch and spear; shield at side. 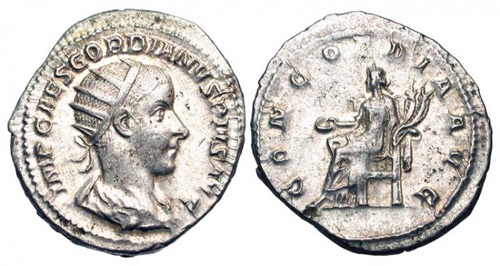 Reverse: CONCORDIA AVG, Concordia seated left, holding patera. 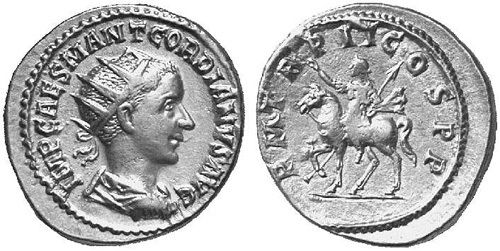 Obverse: IMP CAES GORDIANVS PIVS AVG, Radiate draped and cuirassed bust right. Obverse: IMP GORDIANVS PIVS FEL AVG, Radiate draped and cuirassed bust right. 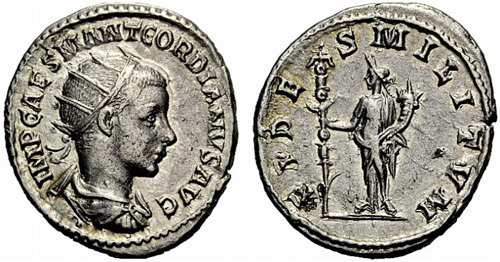 Reverse: CONCORDIA MILIT, Concordia seated left, holding patera and double cornucopia. Reverse: LIBERALITAS AVG III, Liberalitas standing, head left, holding abacus and cornucopia. 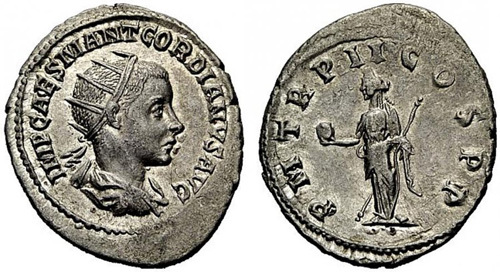 Obverse: IMP GORDIANVS PIVS FEL AVG, Radiate, draped and cuirassed bust right. Reverse: AETERNITATI AVG, Sol standing facing, head left, extending arm and holding globe. 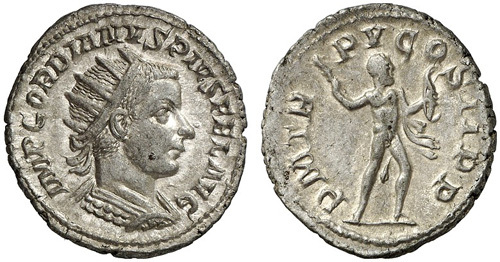 Reverse: IOVI STATORI, Jupiter standing facing, head right, holding thunderbolt and scepter. Reverse: IOVIS STATOR, Jupiter standing facing, head right, holding thunderbolt and scepter. Reverse: LAETITIA AVG N, Laetitia standing left, holding wreath and anchor set on ground. Reverse: P M TR P III COS II P P, Apollo, bare to waist, seated left, holding branch and resting left, elbow on lyre. Reverse: P M TR P IIII COS II P P, Apollo, bare to waist, seated left, holding branch and resting left, elbow on lyre. Reverse: P M TR P V COS II P P, Apollo, bare to waist, seated left, holding branch and resting left, elbow on lyre. Reverse: P M TR P VI COS II P P, Apollo, bare to waist, seated left, holding branch and resting left, elbow on lyre. Reverse: P M TR P IIII COS II P P, Gordian standing right, holding spear and globe. Reverse: P M TR P V COS II P P, Gordian standing right, holding spear and globe. 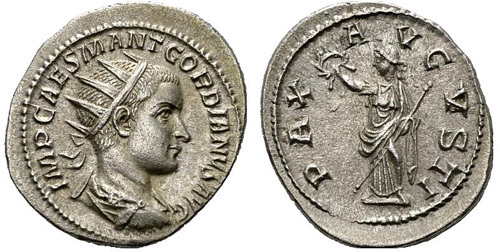 Reverse: P M TR P VI COS II P P, Gordian standing right, holding spear and globe. Reverse: VIRTVTI AVGVSTI, Hercules leaning right on club set on rock; lion skin beside club. Reverse: IOVI CONSERVATORI, Jupiter standing left, holding thunderbolt and scepter. 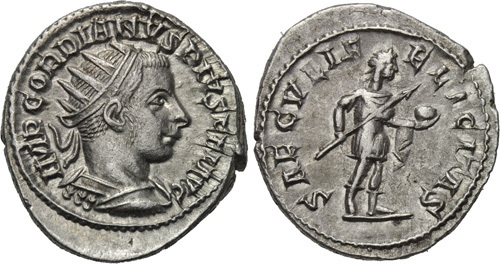 Reverse: P M TR P IIII COS II P P, Emperor in slow quadriga left, holding branch and sceptre, crowned by Victory standing behind him. Reverse: FELICIT TEMP, Felicitas standing left, holding long caduceus and cornucopiae. Reverse: FELICITAS TEMPORVM, Felicitas standing left, holding long caduceus and cornucopiae. Reverse: FORT REDVX, Fortuna seated left with rudder and cornucopiae, under seat, wheel. Reverse: FORTVNA REDVX, Fortuna seated left with rudder and cornucopiae, under seat, wheel. Reverse: MARS PROPVG, Mars walking right, holding spear and shield. Reverse: MARS PROPVGNAT, Mars walking right, holding spear and shield. Reverse: MARTEM PROPVGNATOREM, Mars walking right, holding spear and shield. Reverse: PROVID AVG, Providentia standing left, holding wand over globe, and sceptre. Reverse: PROVIDENTIA AVG, Providentia standing left, holding wand over globe, and sceptre. Reverse: SECVRIT PERP, Securitas standing left with scepter, leaning on column. Reverse: SECVRIT PERPET, Securitas standing left with scepter, leaning on column. Reverse: SECVRITAS PERPETVA, Securitas standing left with scepter, leaning on column. Reverse: VICTOR AETER, Victory standing left, holding palm frond and shield set on captive. Reverse: VICTORIA AETERNA, Victory standing left, holding palm frond and shield set on captive. Reverse: P M TR P VII COS II P P, Mars advancing right, holding spear and shield. Obverse: IMP CAES M ANT GORDIANVS AVG, Radiate, draped and cuirassed bust right. 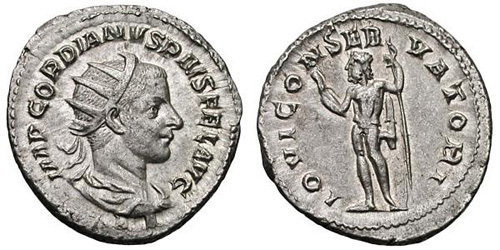 Reverse: M (sic) TR P II COS P P, Libertas standing left, holding cap and transverse scepter. Obverse: IMP CAES M ANT GORDIANVS AVG, Radiate, draped and cuirassed bust left. Reverse: P M TR P II COS P P AVG, The Emperor, veiled, in slow quadriga left. 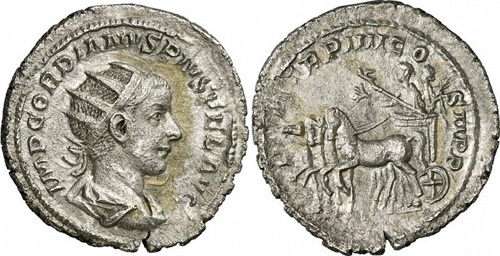 Reverse: P M TR P II COS P P, Gordian III driving quadriga right, holding eagle tipped scepter. 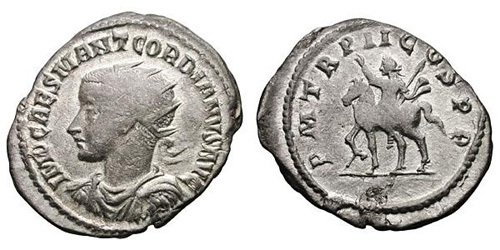 Reverse: P M TR P II COS P P, Emperor on horseback left, raising right hand and holding transverse spear in left. 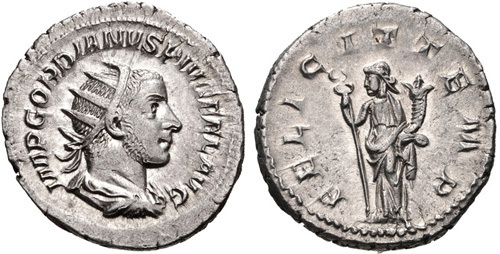 Reverse: P M TR P II COS P P, Gordian, togate and bare-headed, holding roll in left hand, seated left on curule chair, his feet on a footstool, receiving with right hand a branch from Pax standing right before him, and crowned by Victory standing left behind him, who also carries a palm over her left shoulder. 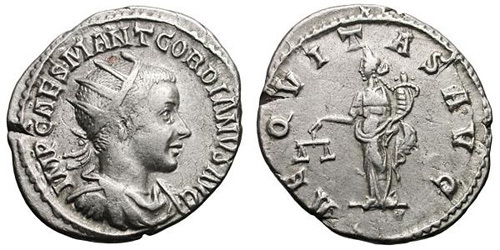 Reverse: AEQVITAS AVG, Aequitas standing left, holding scales and cornucopiae. 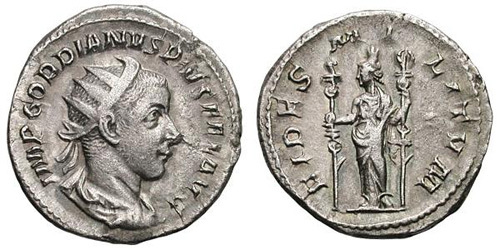 Reverse: CONCORDIA AVG, Concordia standing left, holding patera and cornucopiae, no altar at her feet. 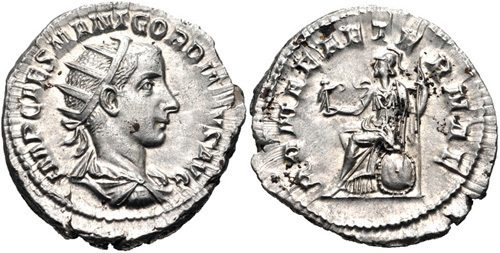 Reverse: CONCORDIA AVG, Concordia standing left, holding patera and cornucopiae, altar at her feet. 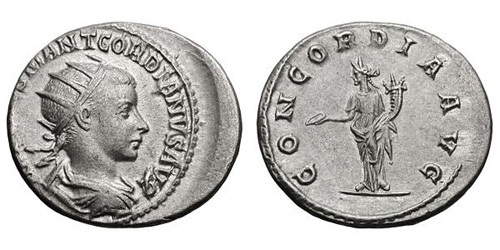 Reverse: CONCORDIA AVG, Concordia standing left, sacrificing out of patera over altar and holding cornucopiae. 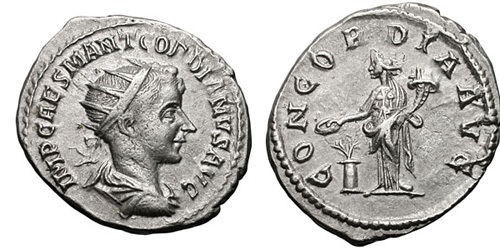 Reverse: CONCORDIA AVG, Concordia seated left with patera and single cornucopiae. 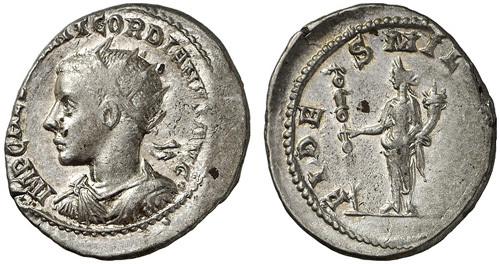 Reverse: CONCORDIA AVG, Concordia seated left with patera. Reverse: FIDES MILITVM, Fides standing left, holding standard and cornucopiae. Obverse: IMP CAES M ANT GORDIANVS AVG, Radiate, cuirassed bust left. Reverse: FIDES MILITVM, Fides seated left, holding standard and cornucopiae. 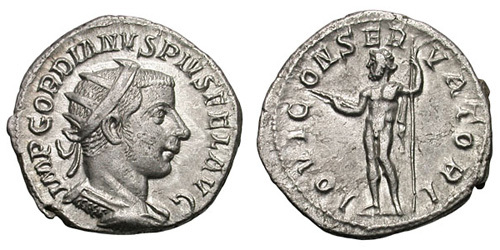 Reverse: LIBERALITAS AVG, Libertas standing left, holding pileus and scepter. 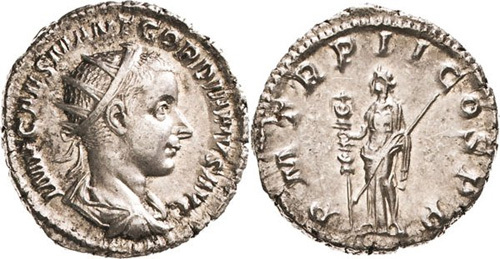 Reverse: LIBEPALITAS AVG, Libertas standing left, holding pileus and scepter. Reverse: PAX AVGVSTI, Pax standing left, holding branch in right hand, transverse scepter in left. Reverse: PAX AVGVSTI, Virtus standing left, holding branch and spear not reversed; (no shield). Reverse: PROVIDENTIA AVG, Providentia standing left, holding globe and sceptre. Reverse: PROVIDENTIA AVG, Providentia standing left, holding wand and scepter, globe at her feet. Reverse: PROVIDENTIA AVG, Fortuna standing left, holding rudder and cornucopia. Reverse: PROVIDENTIA AVG, Providentia standing left, holding cornucopiae and two grain ears over altar. Reverse: PROVIDENTIA AVG, Providentia standing left holding corn ears, over a modius at foot left, and rudder. Reverse: POMAE AETERNAE, Roma seated left above shield, holding Victory and sceptre. Reverse: VICTORIA AVG, Victory advancing left with palm branch and wreath. Reverse: VIRTVS AVG, Virtus standing left, holding spear and resting hand on shield. Reverse: P M TR P V COS II P P, Hercules advancing right, holding bow and raised club. Obverse: IMP GORDIANVS PIVS FEL AVG, Radiate, cuirassed bust right. Reverse: FIDES MILITVM, Fides standing left, wearing crown of towers and holding two standards. Reverse: FORTVNA REDUX, Fortuna seated left with prow and cornucopiae. Obverse: IMP GORDIANVS PIVS FEL AVG, Radiate and cuirassed bust right. 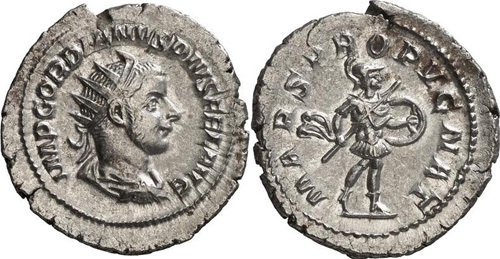 Reverse: IOVI CONSERVATORI, Jupiter standing left, holding thunderbolt and sceptre. 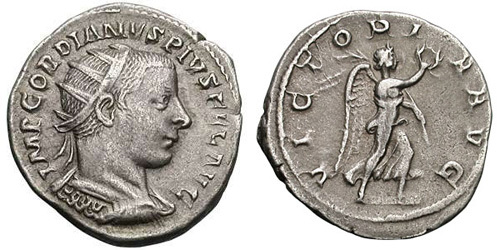 Reverse: MARTI PACIFERO, Mars running left, holding branch before him, reversed spear and shield. Obverse: IMP GORIANVS PIVS FEL AVG, Radiate and cuirassed bust right. Reverse: ORIENS AVG, Sol standing facing, head left, raising hand and holding globe. Reverse: ORIENS AVG N, Sol standing facing, head left, raising hand and holding globe. Reverse: PAX AVGVSTI, Pax running left, holding branch and sceptre. Reverse: PAX AVGVSTI, Pax standing left, holding branch and sceptre. 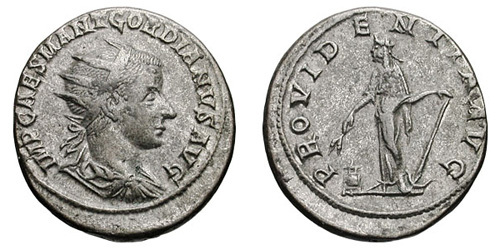 Reverse: SAECVLI FELICITAS, Gordian in military dress standing right, holding spear and globe. 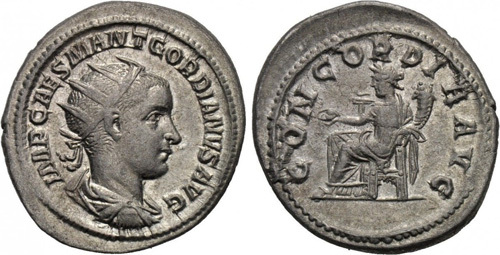 Reverse: VICTORIA AVG, Victory running right, holding wreath and palm. 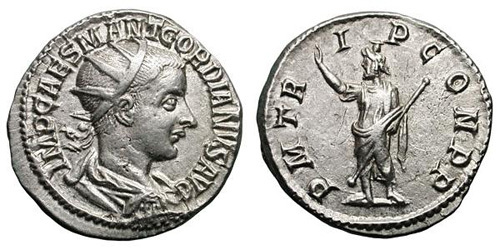 Reverse: VICTORIA GORDIANI AVG, Victory advancing right, holding wreath in right hand, cradling palm frond in left arm. 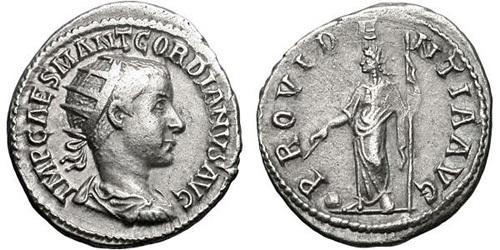 Obverse: IMP CAES GORDIANVS PIVS AVG, Radiate, draped and cuirassed bust right. Reverse: LIBERALITAS AVG III, Liberalitas standing left, holding abacus in right hand, cornucopia in left.